Before you read this post, make sure you check out this article on the HPA axis and how it works. You’ll want to understand how this important hormone balancing system functions, so you can learn how to work it to your advantage! The Hypothalamic-Pituitary-Adrenal-Ovarian axis is an incredibly dynamic system in the body, and it uses positive and negative feedback loops to ensure that external signals to the body cause adaptive changes in the physical body itself. Translation: your body has a set program it’s made to run, but it will alter the expression of the program depending on what the body is exposed to. 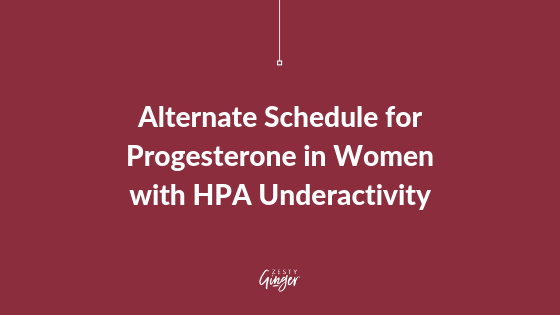 I was originally going to title this article: Alternate Schedule for Progesterone for Low Ovarian Reserve…until I realized ANY female that had exposure to conditions that suppress the HPA axis would likely benefit from this approach. The conditions I’m talking about are things like endometriosis that has caused ovarian damage, hypothalamic amenorrhea, autoimmune-mediated damage and inflammation, perimenopause, and the like. Like this post? Want to share the article? Pin it to your favorite Pinterest boards! What all these things have in common is that they are all LOW HORMONE states. The body often isn’t strong enough to create a strong signal from the hypothalamus down to the hormone-secreting organs and/or the ovaries have had enough egg loss that ovulation–and all that goes along with it–is no longer predictably occurring. When this occurs, many women are started on supplemental hormones to address the symptoms of low estrogen and progesterone, such as low libido, poor sleep, anxiety, weight gain, and skin problems. While this isn’t a long term solution, we understand some hormonal problems are so severe that a short-term solution makes absolute sense. With her low ovarian reserve, Alex had multiple cycles on end nonstop spotting and can relate to how miserable those kinds of symptoms can be. You’ll see that the first half of the graph (up until the big blue block) is when estrogen runs the show. After ovulation, progesterone runs the show. After reading countless physiology textbooks and studies–and monitoring my experiences closely–I’ve realized that supporting progesterone while the body gets ready to ovulate is really important. And that we as a medical community miss the boat on this when we tell women to start progesterone supplementation AFTER ovulation. Progesterone starts to be made by the SEVERAL maturing eggs that get triggered to develop every cycle (actually, it’s the cell around the eggs that make the progesterone). 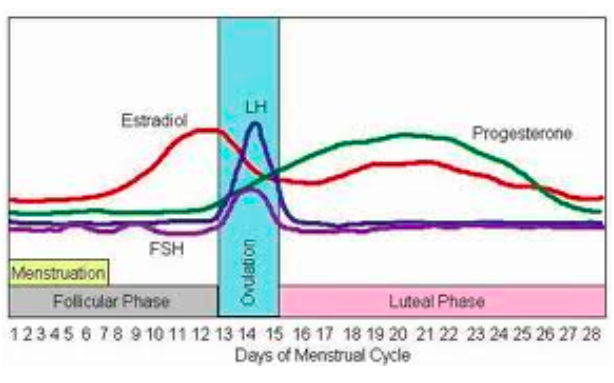 If this is the case, shifting the progesterone schedule from Days 12-26 (instead of the usual 14-28) will help support the body around ovulation while still allowing the progesterone to come off enough that a regular cycle ending can occur around Day 28. 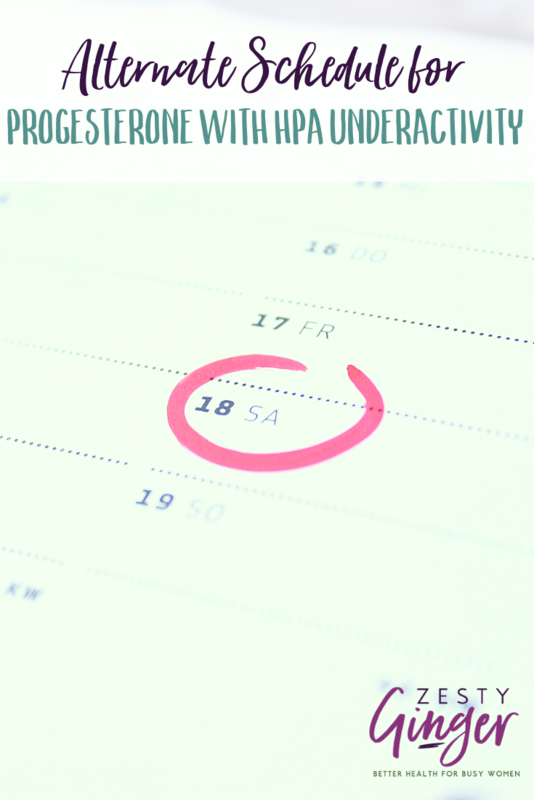 How Can You Tell If This Alternate Progesterone Schedule Is For You? Women who experience frequent spotting around ovulation, have a dip in energy levels and libido around ovulation (when most women seem to be feeling great! ), or have mood changes in the middle of the month may be a good fit for this type of supplemental progesterone schedule. HOWEVER, we are still ALWAYS fans of testing, instead of simply guessing, if something is right for you. If you haven’t already, read our functional testing philosophy. We generally use the DUTCH comprehensive hormone profile because it provides us with the most amount of information about the underlying causes of a suppressed HPA axis. But we also assess the neurotransmitter levels at the same time (through the Neurogenic panel) to make sure the signal that the endocrine system is getting from the brain and spinal cord is appropriate. You can read more about how we support healthy hormonal levels in our ladies by checking out our Healthy Hormones Group Program page. And of course, working closely with the person prescribing your supplemental hormones is crucial to feeling your best with all of this! As you can see by this article–it’s a complicated subject. PLEASE make sure you get testing, and support, as you go through this process. Want more insight on your cycle?? Check out our 4 Phase Cycle Podcast, which can be found on iTunes, Stitcher, and most other places you can listen to podcasts. Season 1 is a 24 podclass series that has everything you need to know about living in sync with your cycle! Want more great content from us? Sign up for our weekly newsletter to get recipes, health tips, and fun new ways to transform your health!